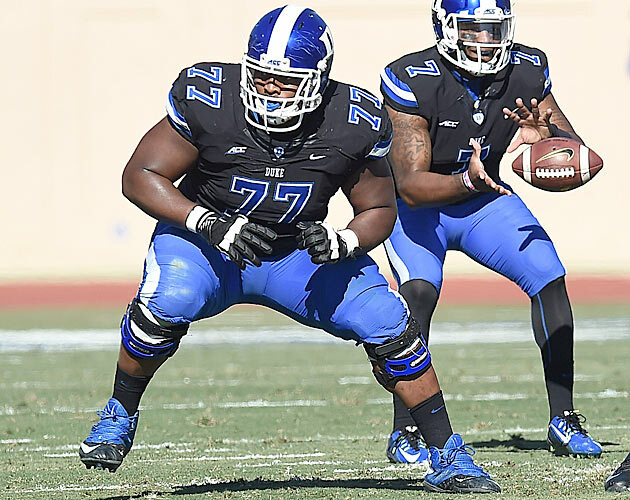 After moving from Jamaica to Chicago, Laken Tomlinson tapped in to his potential in both school and football with the help of a volunteer mentor. 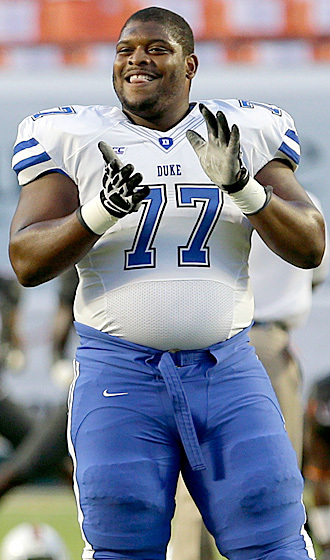 Now Duke's All-America guard faces the choice between an awaiting NFL career and his desire to become a doctor. Laken Tomlinson awoke every weekday before 5:30 a.m., well before the sun rose above his mother’s apartment, and stepped out into the often cold and occasionally dangerous streets of the Rogers Park neighborhood in Chicago. He’d walk to the L stop to catch a Red Line train down to Addison, and then he’d catch the 152 bus, riding that to the Addison/Western stop. Nearly an hour after he had left home, he would finally arrive at Lane Tech College Prep. Tomlinson didn’t have to make such a difficult trip. He could have climbed out of bed later, stayed in Rogers Park and walked a few minutes to Roger C. Sullivan High. Then again, if he had done that he wouldn’t be the person he is, and he probably wouldn’t be a first-team All-America offensive guard for the Blue Devils. “I’d rather go to a good school far away than a poor school that wasn’t going to get me prepared for life,” Tomlinson says. It was a series of decisions to make the longer trip that turned the 10-year-old boy from Jamaica who arrived in the United States on a frigid night into a star football prospect on the verge of reaching the NFL. That is, as long as a career in medicine doesn’t take precedence. Born in Savanna-la-Mar in the Westmoreland Parish of Jamaica, Tomlinson’s early childhood was simple: He would run around barefoot with his friends, climbing trees and playing soccer and cricket. About a decade before he was born, Tomlinson’s grandparents had emigrated from Jamaica to Chicago to set up life in the U.S. and hopefully bring many of their 10 children over, too, as soon as they could afford it. When Tomlinson was 9, his mom told him the time had come to make the move. After a year of filling out paperwork to get their visas, Tomlinson, his mother, Audrey Wilson, and siblings, Jehmaul, Juhvane and Chelsea, flew into O’Hare International Airport on a wintery night. “I remember getting off the plane and out of the airport, and I was like, “Wow, it’s really, really cold,’” Tomlinson says. Luckily, his uncle greeted them with sweaters. “I was really thankful for that,” he says. But even amid the cultural acclimation, Tomlinson showed tremendous potential in the classroom. His principal at Jordan Elementary Community School, Dr. Maurice Harvey, got him involved in Youth Guidance, a program that pairs students with volunteer adult mentors. Tomlinson’s mentor became Bob Sperling, a partner at Winston and Strawn LLP, who grew up in Rogers Park and wanted to help a 10-year-old boy, the same age as his son, Jared. If kids from Jordan were not admitted into a test-in public high school, they’d go to Sullivan, where Sperling had gone. Sperling, who lives in Glencoe, Ill., went to Jordan and met with five 10-year-old boys, including Tomlinson, whom Harvey had strongly recommended to him. An artistic Tomlinson drew with Sperling and impressed him with his natural ease of conversation. Sperling agreed to mentor him. Sperling and Tomlinson’s relationship began that weekend, when Sperling invited Tomlinson, his mom and his younger siblings to dinner at his home. From that point on, Tomlinson would regularly spend time outside of school with Sperling and his family. Sperling began each visit by making sure Tomlinson had completed his homework. They talked about the importance of an education, the adjustment to American culture and the keys to avoiding gangs in Tomlinson’s neighborhood. But mixed in with the mentoring, Tomlinson frequently played with Jared, who he now describes as “like a brother to me.” They went to Chicago Bulls games and to the beach, and played sports with other kids in the neighborhood. Tomlinson even had a Passover Seder with the Sperlings. “He liked the food,” Bob says. Under Rio and Munoz’s coaching, Tomlinson flourished, playing for the varsity team as a sophomore and drawing major-college attention as a junior. By his senior year, “Fluffy became an all-stater,” Rio says. However, even if Tomlinson had never received any of his nearly 30 scholarship offers, his college tuition was taken care of financially. Sperling had previously told him he would pay for college. “He kids me now -- because he’s right -- he saved me a lot of money by being good,” Sperling says. Sperling made Tomlinson call all the coaches he was rejecting, though the Illinois call was tough. “[Zook] will contend that not getting Laken is one of the reasons he lost his job, half kidding, half serious,” Sperling says. Of course, on top of everything else, it helped that Duke has one of the strongest medical programs in the country. Tomlinson’s interest in medicine arose from tragic circumstances. When he was in eighth grade he and his brother Jehmaul had to call an ambulance for their grandfather, Ivan Wilson, after he collapsed in his home. Doctors determined Wilson suffered from ulcers that caused him to bleed into his stomach. He remained in the hospital for several weeks and then recovered. At Duke Tomlinson is pre-med and a psychology and evolutionary anthropology double major. He had already completed his pre-med requirements before this semester began and finished his major requirements this fall by taking abnormal psychology. Completing difficult coursework while training has been a grind, but Cutcliffe says he never worries about Tomlinson. “The only thing I have to watch with Laken is I tell him every now and then, ‘Relax,’” Cutcliffe says. In addition to the required coursework, Tomlinson has taken steps to further his medical education. This summer he shadowed Dr. Carlos Bagley, a neurosurgeon at Duke University Hospital. Tomlinson came before and after training sessions to observe Bagley in the operating room and meeting with patients. Tomlinson even came back to shadow Bagley during Duke’s bye week in-season. While planning a career outside of the game might seem practical for most college players, given how few actually make the NFL, Tomlinson could just as easily put more attention into preparing for the 2015 draft. A first team All-ACC selection last year and a first-team AP All-America this year, he is projected to go in the third or fourth round next spring. He could become the first Duke player selected in the first three rounds since 1999. “There aren’t many that know they have that NFL career on the table kind of right in front of them but still have the forethought to be looking at, ‘OK, what’s next for me?’” says Bagley, who played linebacker at Duke from 1992-95. 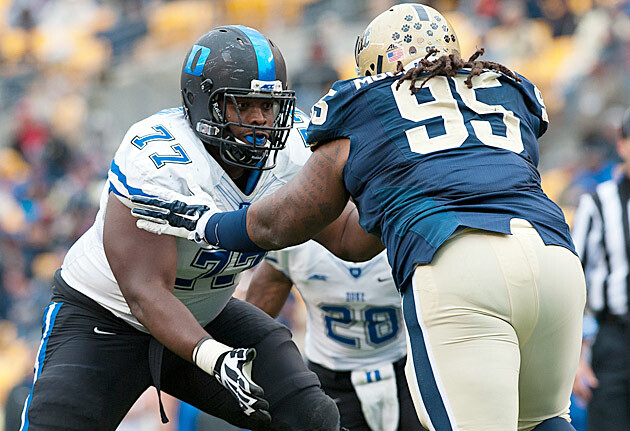 But first Tomlinson has one last game to play in a Duke uniform, as the Blue Devils prepare to face Arizona State in Saturday’s Sun Bowl. It will be the final achievement for a class that bought in to Duke before Cutcliffe had tangible results to show. After going 3-9 in Tomlinson’s first two seasons on campus, the Blue Devils have gone 25-14 over the past three years. They have a chance to post consecutive 10-win seasons for the first time in program history. Tomlinson knows all about that last part. After making it this far, he stands ready to create his own successes, no matter which career path he chooses.